So I'm rather fond of Jake Speed (1986) which was a fun movie, which I reviewed here. Then I discovered the prequel comic strip which was done as promo for the movie. But the thing that had eluded me was the novelisation from Gold Eagle. It has an ISBN (from Wikipedia "A novelization, written under the pseudonym Reno Melon, Jake and Des' writing nom de plume, was published on June 1, 1986, by Gold Eagle/Harlequin (ISBN 0-373-62102-7)." Forces of Geek has a cover image, which may be a recreation from the movie. The late Wayne Crawford said in an imdb post (from the now defunct message boards) that there was a novelisation. Amazon has a page for it. The evidence all pointed that there was a novelisation. People said that they had owned one that they had lost. Then on facebook I found that Mark Ellis (who wrote for Gold Eagle under several names including James Axler) pointed out an article in the International Association of Media Tie-In Writers newsletter. by Ron Renauld. Being a fan of serial vigilante TV, I recognised his name. Renauld wrote novelisations for Airwolf, Street Hawk and The A-Team both under his own name and under pennames Charles Heath and Jack Roberts. He says that those gigs got him his shot a Gold Eagle where he wrote several Able Team and Executioners but the first novel he was contracted to write was Jake Speed. The movie's release was moved up six months and Gold Eagle scrapped publications plans and the book was never published. So it was written but never published and the plans for publication would have included getting an ISBN before it was scrapped. This mystery is solved ... for now. Who knows the novel may come out or have gotten a facelift and been published (like 50 Shades of Grey started life as Twilight fanfic). There is a rumour that the first Jake Strait novel from Gold Eagle "Avenging Angel" by Frank Rich was a rewritten version of Jake Speed but the plot description "The city rises like an evil vision from its surrounding the heavily guarded suburbs, the garrisoned farmlands. Life is sweeter in the fortified elite Hill section where the privileged few live, but elsewhere the city makes its own rules for life and death. Even in this ruthless, anything-goes world, Jake Strait has his limits-a line that he won't cross willingly. He won't do political jobs. But when a rich, pampered couple from Hill sets him up, he is drawn into a plot that plans to drench the city with blood." doesn't match up with what we saw in the movie at all..
Why waste a manuscript, though. If the Jake Speed novel was written, Renauld may have turned the manuscript into something else. Is there a listing of his books somewhere? Maybe we should read his later books to see if anything sounds like a possible Jake Speed rewrite. I'm a bit late to the party here, but thanks for putting this mystery to rest. 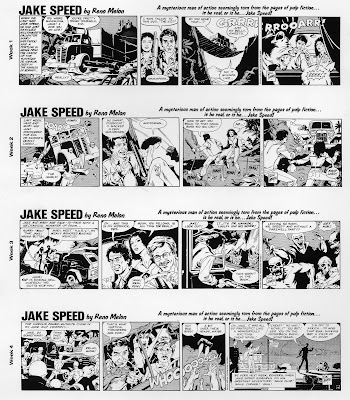 On a similar note, there is probably at least one other unpublished Jake Speed manuscript out there. Wayne Crawford was a guest at the 1989 Atlanta Fantasy Fair, and at his panel he told my wife he was writing the first in a proposed series of JS paperback novels. He didn't mention the intended publisher, and I guess the project eventually failed to launch.